As you may have noticed, this has turned into a linkblog. Blame my job. Blame one of your fellow readers for alerting me of the job’s existence. Andrew Gelman asks Do college football results impact the election? Darryl Yong in the Notices of the AMS: Adventures in teaching: A professor goes to high school to learn about teaching math? Technology Review reports on Univfy, a startup answering the question of what your chances of conceiving a baby via IVF are. David Talbot at Technology Review asks what google knows about the presidential race. Papercraft sculptures based on Byrne’s Euclid. Donald Saari, who works on the theory of voting, goes to a fourth grade classroom. The fourth graders are surprisingly smart. Rick Wicklin simulates playing craps with unfair dice. StubHub has a data blog. The first post examines the correlations between preference in sport (baseball vs. football) and political party (Democratic vs. Republican). Integrals don’t have anything to do within discrete math, do they?. By Mark Kayll, winner of the MAA’s Allendoerfer prize for articles published in Mathematics Magazine. Allen Downey has a rough draft of his book Think Bayes. Steven Strogatz has written a brief, nontechnical introduction to catastrophe theory for the New York Times. Probability and game theory in The Hunger Games. The Daily Show with Nate Silver. Brian Hayes writes about sphere packing for American Scientist and talks about how he made the images for his blog. David Barber has written a textbook, freely available online, entitled Bayesian reasoning and machine learning. The answer is the square root of 2. But how to see this? Well, without loss of generality we can assume c = 1. So we want to know, if a and b are the sides of a right triangle with hypotenuse 1, what is the largest possible value of a + b? 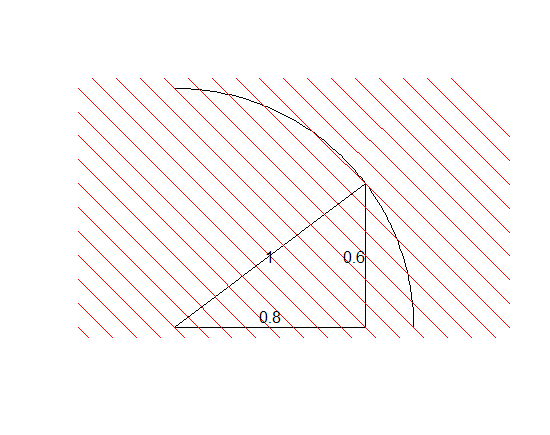 Now a and b are, respectively, cos θ and sin θ for some acute angle θ… so we want to maximize over acute angles $\theta$. But how? Differentiate? That sounds like work. Take a look at the picture below. Imagine moving the upper right corner of the (black) right triangle along the (black) circular arc; we’re looking for the point where the sum of the lengths of the legs is maximized. But now say we can move the upper right corner of the right triangle wherever we want it. As long as we stay along one of those red lines — which have slope -1, i. e. make a 45-degree angle with each axis, the sum of the leg lengths stays constant! This is, secretly, the principle behind using Lagrange multipliers to maximize a function subject to a constraint. It’s also much easier to see than to explain. David Spiegelhalter suggests that older should mean bolder. Lethal risks are less dangerous if you’re old, because you have less to lose. Freakonomics Q&A with Nate Silver. A new geometric minimal composition every day. forecasting the Presidential election using regression, simulation, or dynamic programming. Stein’s paradox in statistics, by Bradley Efron and Carl Morris. The Simons Foundation has an article by Erica Klarreich, Getting Into Shapes: From Hyperbolic Geometry to Cube Complexes and Back”, on Thurston’s geometrization conjecture. The first function here, tri, outputs triangular numbers; the second tells you if its input is a square, and is taken from this Stackoverflow answer. next_tri is where the “magic” happens; it outputs the index of the first triangular number k greater than n such that tri(n)*tri(k) is a square. But since this loop may, a priori, be infinite, we cut this off at k = n+m. If none of tri(n)tri(n+1), tri(n)tri(n+2), …, tri(n)tri(n+m) are square, it outputs 0. Finally, calling answers(n,m) outputs the list answers(1,m), answers(2,m), …, answers(n,m). [8, 24, 48, 80, 120, 168, 224, 49, 360, 440]. This is an identity that’s not hard to prove, and answers Tanton’s question in the affirmative, but I think it’s hard to discover without computation. Of course you could do the computation by hand, but it’s 2012. But this identity tells us that — and this is true, but 288 is not the smallest solution to the problem that Tanton originally posed. In fact the computer search gives . When do smaller solutions exist? Steven Strogatz digs up a clip about the birthday problem on the Tonight Show. In the Guardian, is it Mitt Romney’s fault, if he loses?, with regressions based on approval ratings.